In this installation, Devon Bryant uses a pre­existing souvenir sign as inspiration to completely transform the building in to a multi­level circus spectacle. Lights flicker and flash, carnival posters move, and strange performers peek out through open windows. Six projectors are used to entirely cover the 3 story facade with light and transport the view to a different time and place. Devon Bryant is a multi-media artist specializing in all aspects of projection mapping based in Charlestown, MA. 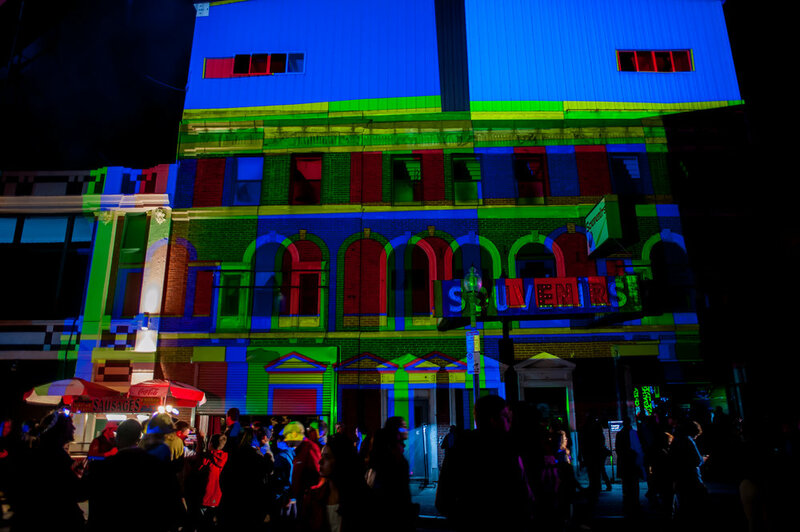 In the past five years he has been involved in numerous large scale projection and video projects in Boston including the 2014 Illuminus festival, Boston Cyberarts’ Art on the Marquee program, and Zebbler Studios First Night mapping of the Boston Public Library. He is also well known for his work with projection stages for nation touring acts EOTO, Shpongle, and ZEE, and for festivals such as Unifier, Bloomtown, and DefCon. Devon is a co-curator and contributor to Glitch Gallery and is represented by Zebbler Studios.